Griddle or grill the lamb cutlets. Heat the oil in a deep sided frying pan or wok. Add the onion and fry until soft, add garlic and continue frying for 1 minute. Add drained butterbeans with 2 Tbsp water, gently heat through, then mash with a potato masher. Add a further splash of olive oil to the butter bean mash if dry. Stir in rosemary and serve with lamb cutlets. 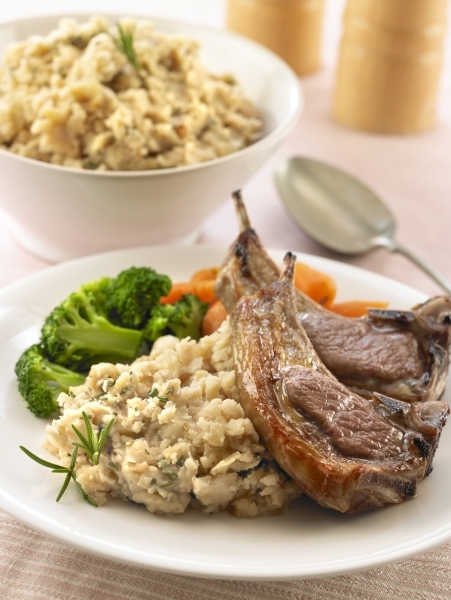 Butterbean mash is also delicious served with pork chops or sausages. Try using different varieties of beans to make your mash.